Patchoo 0.944 has been pushed and fixes handling of zipped pkg bundles on Casper 9. I've only recently migrated to the new 9 format (don't ask) and there was a bug when looking up zipped pkg friendly names in the JSS. correctly handle and lookup zipped pkg bundle info from the JSS. quoted api credentials handle special chars in passwords. 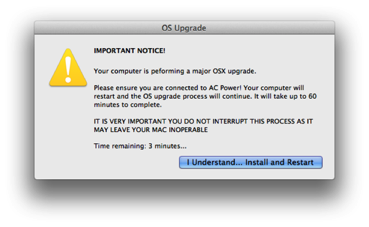 Did you know you can perform major OSX upgrades via Patchoo? By using createOSXInstallPKG and patchoo you can provide as convenient admin hands-off major OSX upgrade deployment to 10.9 (or 10.10) via Casper. 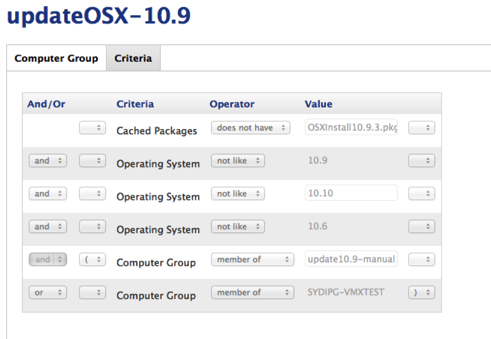 And then you can setup a static computer group (update10.9-manual) to add Macs you wish to upgrade to. Group them in ( ) with OR, and you can add an entire department or office smart group to deploy Mavericks (or Yosemite) to a all computers without further admin interaction. Once they are scoped correctly (make sure you check! ), you might like to send an email direct from the JSS advising users of the impending upgrade and what to expect. Don't have your JSS populated with your user's directory information and email addresses? Don't worry, I can help there too. 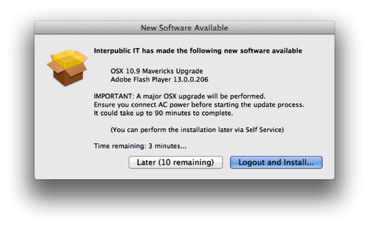 Users receive updates in the same way they usually do, but are prompted additionally that the update requires AC power and will take up to 90 minutes.